Born: 1873, Shawforth, Lancashire, England. Died: 1 October 1934, Johannesburg, South Africa. James A. Wilkinson, eldest son of James Wilkinson, a director of companies, attended the Manchester Grammar School, where he was athletic champion from 1888 to 1890. He continued his education at Gonville and Caius College, University of Cambridge, where he was awarded the degree Master of Arts (MA). Subsequently he taught at Rugby School in Warwickshire. He was elected a Fellow of the Chemical Society (FCS), was a member of the Society of Chemical Industry, and later became a member of the Institution of Chemical Engineers. 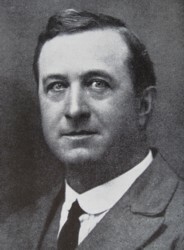 In 1902, at the end of the Anglo-Boer War (1899-1902), Wilkinson came to the Transvaal Colony to take up a post as science teacher at the Boys' High School in Johannesburg. Two years later he was appointed professor of chemistry at the newly established Transvaal Technical Institute, where he initially taught both inorganic and organic chemistry, both theoretical and practical. He remained head of the department until his retirement in 1933. During this period the institute developed into the Transvaal University College (1906), the South African School of Mines and Technology (1910), and eventually the University of the Witwatersrand (1922), a process in which he participated actively. The name of his department was changed to the Department of Chemistry and Chemical Technology in 1922, and became the Department of Chemistry and Chemical Engineering in 1928. Though more a teacher than an academic, he was a lively lecturer who took an active interest in his students, and was affectionately known as "Loots". Wilkinson's main contribution to chemical technology appears to have been a series of four articles in the South African Journal of Industries (1917-1919, Vol. 1(16) - 2(3)) on "Coal - its value as a raw material for distillation products", dealing with liquid products, coal tar, oils, pitch, and coal gas. Other publications by him dealt with "Mining education" (Journal of the Chemcial, Metallurgical and Mining Society of South Africa, 1906/7, Vol. 7), "Pharmaceutical education in South Africa" (Transvaal Medical Journal, 1909/10, Vol. 5), and "Fischer's synthesis of depsides and tanning substances" (Report of the South African Association for the Advancement of Science, 1916). Though Wilkinson did not publish much, he was an active member of several scientific societies. In 1902 he became a member of the Chemical, Metallurgical and Mining Society of South Africa, served on its council and on its editorial committee from 1904, and was its president for 1916/7. He became a member of the South African Association for the Advancement of Science in 1904, served as president of Section B (which included chemistry) in 1916, and as president of the association in 1924. His presidential address was "A review of some developments in chemistry during this century". In 1914 he became a member of the South African Association of Analytical Chemists, served on its council from 1915 and as president for 1918/19. He remained a member when the association became the South African Chemical Institute in 1921, serving on its council for many years and as president again in 1926/27. From 1911 to 1919 he was chairman of the Chemical Section of the South African Engineering Standards Committee. In 1929 he was chaiman of the executive committee of the British Association for the Advancement of Science for its meeting in South Africa that year, and in 1931 was one of the ten scientists who represented South Africa at the association's centenary meeting. He was elected the first honorary member of the Transvaal Pharmaceutical Society and in 1920 participated in the formation of the Associated Scientific and Technical Societies of South Africa. In 1908 the University of the Cape of Good Hope admitted him to the MA degree on the basis of his Cambridge degree. Subsequently, in 1913 and 1915, the university used him as an examiner in chemistry at the MA level. Outside the academic world Wilkinson was closely connected with the formation of the South African Red Cross Society, serving as chairman of its executive council from its foundation in 1913 to 1919, and was a member of the Historical Monuments Commission. He was survived by his wife, Lilian Eliazabeth Wilkinson, and one son. British Association for the Advancement of Science. Report of the ninety-seventh meeting... South Africa, 1929. Chemical, Metallurgical and Mining Society of South Africa. Proceedings, 1902-1903, Vol. 3, list of members; Journal, 1904-1914, Vol. 5-9 and 12-14; 1934, Vol. 34(9), Whole number on the 40th anniversary of the society; 1934, Vol. 35(4), p. 93, brief obituary. In memoriam: Professor J.A. Wilkinson, MA, MIChemE. South African Journal of Science, 1935, Vol. 32, p. xlii. National Archives Repository (TAB), Source MHG, Vol. 0, Ref. 86526: death notice, James Alfred Wilkinson. National Automated Archival Information Retrieval System (NAAIRS). . Documents relating to Wilkinson, James Alfred / Wilkinson, J.A. / Prof. Wilkinson. South African Association for the Advancement of Science. Report, 1905/6. 1910, 1916, 1918. South African Journal of Science, 1924, Vol. 21, pp. 1-38: Presidential address; 1937, Vol. 34, pp. xiii-xix: Office bearers. Transvaal Medical Journal, 1909/10, Vol. 5, paper by Wilkinson. University of the Cape of Good Hope. Calendar, 1909/10, 1913/4, 1915/6. Volckman, O.B. Chemical engineering at the University of the Witwatersrand, Johannesburg. Part I: A brief history. Chemsa, 1983, Vol. 9, pp. 37-38.